Delta employees and customers showcased their commitment to ‘Carrying Us Closer to a Cure’ by raising an unprecedented $1.75 million for the Breast Cancer Research Foundation during the airline’s month-long campaign last October. 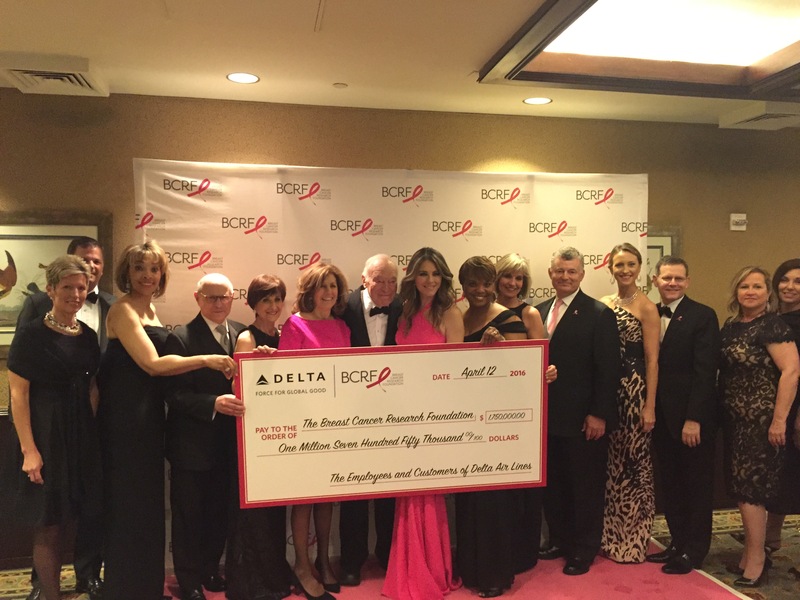 Sandy Gordon, Vice President – In-Flight Service, Field Operations, along with leaders and employees from across the system, presented BCRF with the donation at its annual Hot Pink Party at the Waldorf Astoria in New York City last week. This year’s donation exceeded the airline’s 2014 donation by nearly half a million. Delta’s month-long campaign to generate awareness and raise money for BCRF kicked off with the airline’s 11th annual “Breast Cancer One" employee survivor flight, which carried more than 140 employee breast cancer survivors on board Delta’s pink plane on the flight’s first international route from New York City to Mexico City. Survivors were celebrated by Delta leaders, employees and customers during festivities in both cities and were treated to an overnight stay in Mexico City, where they met with one of BCRF’s world-renowned researchers. 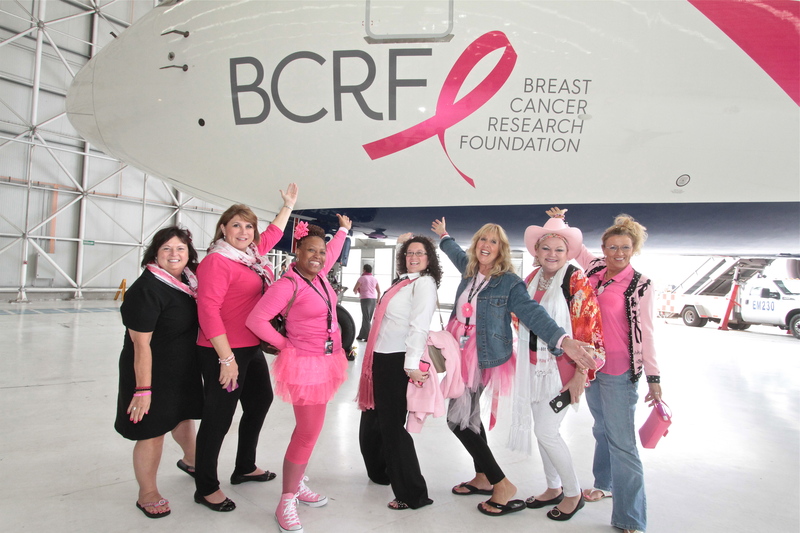 During the campaign, employees donned pink uniforms and sold pink products such as pink lemonade and pink-branded headsets on board Delta flights and in Delta Sky Clubs with all proceeds benefiting BCRF. The airline also set up Pink Boutiques across the system where Delta people could contribute to the campaign by purchasing BCRF merchandise. Employees and customers were able to donate on Delta’s BCRF website as well. More than 1,000 of New York City’s most prominent philanthropists and celebrity guests attended this year’s Hot Pink Party, which supports BCRF’s mission to raise funds for lifesaving breast cancer research. The event raised $6.8 million while celebrating the gift of friendship and support.
" There is nothing more inspiring than celebrating the power of unity," said Myra Biblowit, President of BCRF. "The support BCRF receives from Delta exemplifies the truest tenet of friendship—that we can make each other stronger, and make the world better, together." With this year’s donation, Delta's employees, customers and their friends and families have raised $11 million for the Breast Cancer Research Foundation since 2005. The collective contributions have also funded the vital work of 37 different research projects over the years. BCRF advances the world's most promising research to eradicate breast cancer. Founded by Evelyn H. Lauder in 1993, BCRF has raised more than $550 million to fuel discoveries in tumor biology, genetics, prevention, treatment, survivorship and metastasis. By spending 91 cents of every dollar on research and public awareness, BCRF remains one of the nation's most fiscally responsible nonprofits.